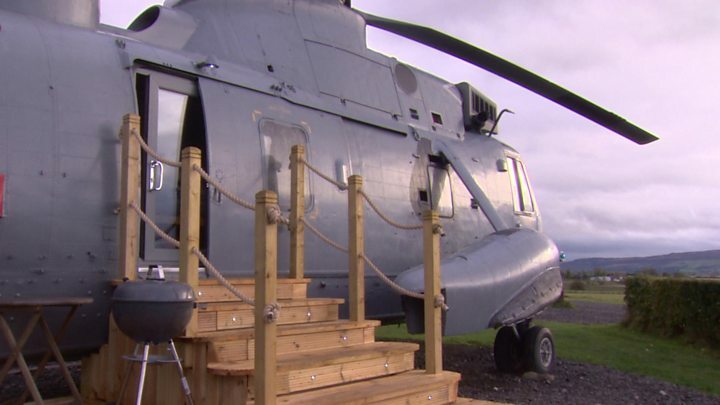 A retired helicopter, which was bought at an Ministry of Defence auction, has been transformed into a glamping pod. The 17m (56ft) Royal Navy Sea King was bought by Stirling farmer Martyn Steedman for £7,000. He has now had it converted into a holiday home, complete with a shower room and mini kitchen, which can sleep a family of six. The idea for the conversion came to Mr Steedman and his wife Louise following the Sea Kings' final fly past over Stirling earlier this year, which marked the end of active service for the entire fleet. "We saw the Sea Kings being retired and they flew over the Wallace Monument which was quite an amazing thing to see," Mr Steadman told BBC Scotland. "Then in the paper the next day they were talking about selling them off and I just thought 'that would be an idea - something completely different'. "I just thought it was such a shame that they were just going to go for scrap. "When we bid in the auction we actually bid for the rotors first as they were first in the auction. We were then panicking, thinking we were going to have rotors without a helicopter - but then no-one bid against us." The aircraft was driven 320 miles by road from Grantham, Lincolnshire, to Mains Farm Wigwams, Thornhill, before a crane lifted it into position at the couple's campsite. Mr Steedman retained the helicopter's sliding door and replaced the tail rotors with ones he bought online. The helicopter now has a double and a triple bed as well as a single bed in the tail. New doubled-glazed patio doors have also been added to the side of the helicopter which lead out onto a decked area. Many of the Sea King's original features have been retained inside, except for the sonar station which was removed and donated to The Helicopter Museum in Weston-super-Mare, to make way for a shower room and mini-kitchen. The toilet is now located where the sonar operator once sat. From the cockpit, holidaymakers can enjoy panoramic views over the Carse of Stirling. The flight deck has been refitted with swivel seats and a table made from an old fuel tank cover. Mr Steedman said most people going past could not believe there was a helicopter parked up. "I think most people think it's just landed," he said. "We put all the original lights back on - it's got the spotlights at the front and the flashing lights in the tail and at night it really looks like its just landed. "I think the cockpit's pretty good. It's got a lot of buttons and stuff the kids can look at and we've actually got it all lit up now so you can actually sit up the front and the kids can play or and you can sit with a glass of wine, look at the view and think that you're actually flying along in a helicopter."